would have to have a PhD. All wines have there own unique characteristics and flavor profiles. One doesnt have to taste every wine out there to know about more about the types of red wine. By remembering which wine characteristics of each of the major varietals, you will be able to recommend wines for your tables and understand food and wine pairings. After tasting wines for a while, you will start to pin point which characteristics show more from different areas. Tasting is the best way to learn about wines! TASTE! TASTE! TASTE all the wines on the wine list if you can. CABERNET SAUVIGNON ( ka-behr-NAY SOH-vihn-YOHN ) gives a tannic, very dark red with little purple in it when they are young, the color fades as they get older. It has aromas of blackcurrants in young wines, cedar in older ones. The taste of young cab is often harsh due to its tannins, but also gives it ability to age. Also a primary blending grape in the left bank of Bordeaux. CABERNET FRANC ( ka behr-nay Frahn) produces wine that is similar to Cabernet Sauvignon, but with little capacity to age but offers herbaceousness and earthiness. It also is used as a blending grape for Bordeauxs (Graves and Medoc) Claret, Meritage, which means a blending of grapes. PINOT NOIR ( PEA-no Nwahr ) younger wines have fruity characteristics of cherries, plum, raspberries, and strawberries. Mature wines develop flavors of deep cherry, violet, chocolate, game, figs, smokiness and truffles. Also the red grape in Burgundy, France. ZINFANDEL (ZIN-fuhn_dehl ) the best are deep red wines which come from old vines, with flavors of spice and black fruits. It also is used for white zinfandel. GRENACHE ( gruh-NAHSH ) comes in white and red varieties, flourishes in hot climates, also a Rhone varietals, it is primary component in Chateau Neuf de Pape. Known as Granache in Spain. MOUVEDRE ( moor-VEH-druh ) this grape thrives in warm, dry climates, also a component in Rhone varietals. Its depth in color and fruitiness, spiciness and peppery qualities are associated with wild berries. Its used to add color and structure. 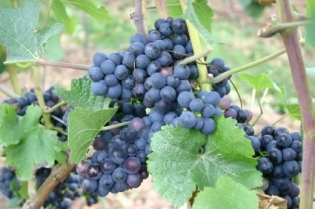 GAMAY (ga-may) used in wines from Beaujolais, for variety produces fresh, fruity types of red wines. SANGIOVESE ( san-joh-VAH-zeh ) one of the top two Italian varieties, other being Nebbiolo, these grapes have a hint of earthiness, but not a lot of fruit.